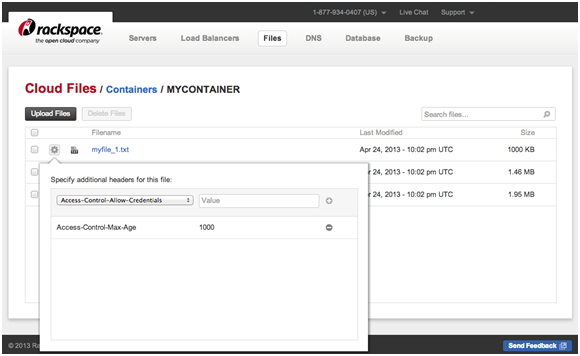 Rackspace Cloud Files users now have finer control over how to manage objects and containers with several exciting new API and Control Panel features that we rolled out this week. All of these features are now available in both the U.S. and U.K. regions. To avoid the risk of getting into TL;DR territory; let’s take a high-level look at how each new feature works. I’ll follow-up with subsequent posts in coming weeks that dig deeper into how each new feature works along with specific API details. You can now set simple quotas on your containers by setting the X-Container-Meta-Quota-Bytes and X-Container-Meta-Quota-Count headers in your container metadata. This can be useful for administrators who want to put limits on containers used by non-admin users (users who cannot modify container metadata). The X-Container-Meta-Quota-Bytes header is used to limit the maximum size of a container, in bytes. The X-Container-Meta-Quota-Count header is used to set the maximum object count of the container. With the new TempURL File Name Override feature, you can specify a “filename” query parameter to override a TempURL’s Content-Disposition header in order to instruct their browser to save a TempURL file with a specific name. This is done by appending &filename=my_file_name to the end of a TempURL. Two new bulk operations are now available: delete and archive auto extractions. You can upload and auto-extract tar archives upon PUT request to your Cloud Files account. This is done using the query parameter ?extract-archive=format specifying the format of archive file. Accepted formats are tar, tar.gz, and tar.bz2. Root directories in the archive will be converted to containers if uploaded at the account level, or mapped to pseudo-directory names if uploaded into existing containers. Static Large Object Support (SLO) is very similar to Dynamic Large Object (DLO) support in that it allows you to upload many objects concurrently and download them afterwards as a single object. It is different than DLO in that it does not rely on eventually consistent container listings to do so. Instead, a user-defined manifest of the object segments is used to help guarantee that every segment in the manifest exists and has matched the specifications. If everything does match, you will receive a 2xx response and the SLO object is ready for downloading. This can improve consistency when uploading multiple segments concurrently and subsequently downloading the resulting large object a short time after. You can now use the Control Panel to select and upload multiple files through one Upload Files operation. From your container, select the Upload Files operation and the click the Choose Files button. 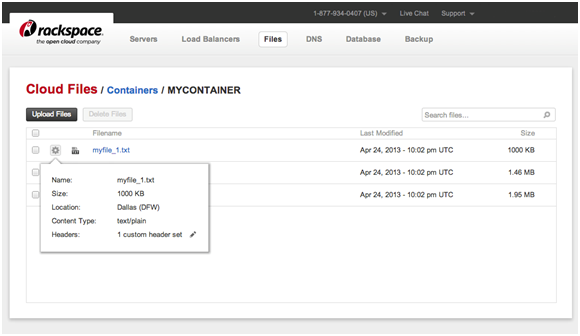 Select the multiple files you want to upload to your container. After you have selected them for upload, notice that the number of files selected is shown next to the Choose Files button. Now select the Upload File button. At this point your files will be uploaded into your Cloud Files account. 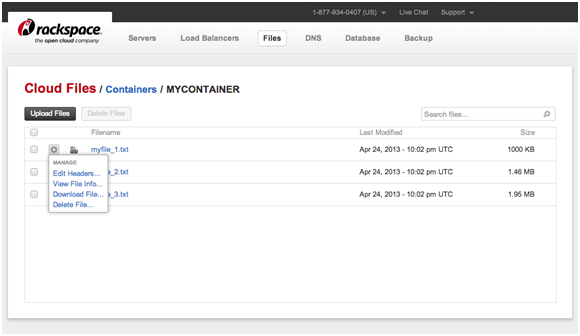 Once the operation has completed, the Control Panel will show the updated contents of your container. To edit object headers, go to the cogwheel next to your object and select Edit Headers from the drop down. You will see any custom headers that have been set when you select the View File Info dropdown from your object’s cogwheel. Reselecting Edit Headers from the cogwheel drop down will allow you to set any additional headers or modify existing ones that you had previously configured. For additional information on setting object headers or details on any other Cloud Files features, please refer to the Cloud Files API Developer guide. Stay tuned for upcoming posts with details on how to access these new features through the API with command-line examples using cURL. If you have additional questions, please feel free to ask them here, contact our Fanatical Support Team or email me directly at jose.malacara@rackspace.com. Be sure to subscribe to our product and development blog for future product updates and announcements. For a deeper look at some of these features, head over to the Rackspace DevOps Blog. Jose Malacara was a Product Manager on the Big Data team at Rackspace. Jose has 12 years of broad IT experience working in various engineering, sales and product roles. Jose holds a bachelor's degree in Geography from the University of Texas at Austin and an MBA from Concordia University Texas. Jose joined Rackspace in 2012, excited to be part of a world-class organization that shares his passion for building great technology products. When he isn't chasing his two little ones around the house, Jose enjoys restoring his 1969 Ford Bronco and is an avid woodworker.